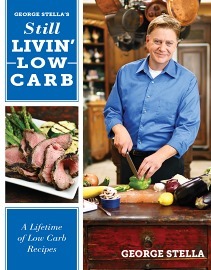 If there is a superstar in the world of low-carb cooking, it is George Stella. He has helped thousands of people lose weight and regain their health though his popular show, Low Carb and Lovin’ It, on the Food Network and his many best-selling low-carb cookbooks. Most recently, he appeared on the Dr. Oz show http://www.doctoroz.com/videos/family-lost-500-pounds-pt-2 with his family to share the story of how he lost 265 pounds and his family of four lost a total of over 500 pounds by eliminating starch and sugar from their diets. I’ve had the opportunity to work with George on a couple of projects for the EZ-Sweetz company. I can tell you that George is every bit the outgoing, cheerful, and energetic man he appears to be on TV. He and I are going to be the featured food writers on the EZ-Sweetz Facebook page at http://www.facebook.com/ezsweetz. They posted a nice write up to introduce me; George will come next. (Thank you, Nick!) I will be sharing a lot more news about EZ-Sweetz soon, as they are planning a major media blitz to accompany the introduction of this new, zero-carb and zero-calorie sweetener in retail stores in a few weeks. Wow. My book on George Stella’s table. But there is more: he followed up with an e-mail to me that said, “…And our friends and relatives, incl my in laws, have all picked up your book while here and they love it! I think it is one of the best ever written!” Thank you, George! I know it is hyperbole, but, well, all I can say is ~ wow. I neglected to post links to some other reviews of Nourished (by other low-carb superstars) that came out after it was released, so as long as I’m indulging in a bit of shameless self-promotion, I will add links to those too. I hope I didn’t miss any. Thanks to all of you! Amy Dungan, Dr. Robert Su, George Stella, Jennifer Eloff, Jimmy Moore, John Koenig, Super stars reviews of "Nourished, Tom Naughton. Bookmark. Thank you, Jennifer. You are a dear, sweet friend and I'm glad we connected. Isn't the internet wonderful?